These organic cattle roam free in open pastures and graze on grass. 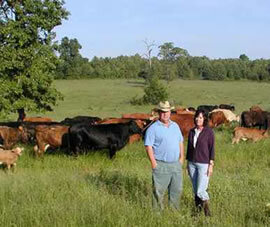 Photo Courtesy of American Grass Fed Beef. Organic farming is farming without the use of synthetic chemicals, many of which can be found in the pesticides and fertilizers used in conventional farming. Most Americans think organically grown food is safer and healthier. In the 1970s, organic farming began to develop as an industry. Initially, organically grown products could be found only in small health food stores. Because demand has risen over the years, today most organically grown products are sold in supermarkets. State or private inspectors now certify organic crops thus ensuring that "organic" food is grown according to the principles of organic farming. Some of the principles used in organic farming are biodiversity, natural (no synthetic chemicals) plant nutrition, and natural pest management. Click on CHARTS below for additional information about organic farming.